Three finalist architects in the design competition for the Telluride Transfer Warehouse were in Telluride on May 30th for the final stretch of a design competition that began in January. Each firm, Gluckman Tang, NADAAA, and LTL, shared preliminary conceptual designs during an open house for the public. Each firm addressed the specific program needs that had been identified by Telluride Arts through community planning meetings over the course of the last two years. 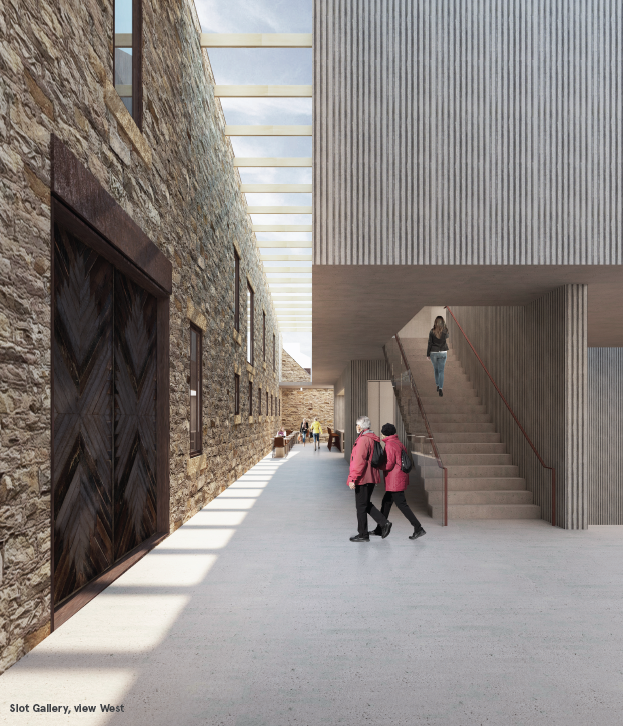 The priorities are flexible spaces for exhibitions and events, allowing the historic stone to be exposed, and providing for a flow between the inside and outside. The three designs were very diverse, but all shared the approach of building a box within the walls to maximize the exposure of the historic stone on the inside. The top firm, squarely winning the hearts and minds of both the community and committee, is LTL; Lewis. Tsurumaki.Lewis, from New York, NY. In reference to the tree that had been growing in the roofless ruin for almost 40 years, LTL included an open atrium at the east entry that includes a large tree and a retractable roof section open to the views and mountain air. This sensitivity to the recent history of the building, combined with a warm, welcoming, intuitive design that uses a sustainably harvested wood material, won the favor of the community. The design is both contemporary and warm, with a wooden ark-type structure inserted into the interior of the stone walls that provides appealing spaces throughout the building, including a roof top deck, an underground event space, galleries, and an entry courtyard that opens into the building at the first floor level. Steven Gluckstern, a local proponent of the project and selection committee member, aptly describes the structure as a "cultural ark for our community". The LTL team, represented by the firm’s principal architects, twin brothers David and Paul Lewis, and partner Marc Tsumuraki, also included Nancy Hudson, a structural engineer with Silman, who spoke in depth about the coordination of the historic restoration of the existing structure with the construction of the new interior. Silman is a structural engineering firm that specializes in historic stabilization, that kept Frank Lloyd Wrights “Falling Water from falling into the water” and numerous other high profile preservation projects. LTL ‘s qualifications are far too long to list, and include the Center for Contemporary Art in Austin, TX, which shares some similarities with the Transfer Warehouse. Over the course of the next few months, LTL will be visiting Telluride to hone their designs through charrettes with the community. The restoration of the historic walls is planned to begin this summer, with the new construction slated for 2018/2019. The winning design is on display at Telluride Arts HQ.